Preventing moisture from getting trapped in the building envelope is key to constructing long-lasting homes that stay dry and comfortable. Most of the construction details that help to keep a home dry are simple to install. 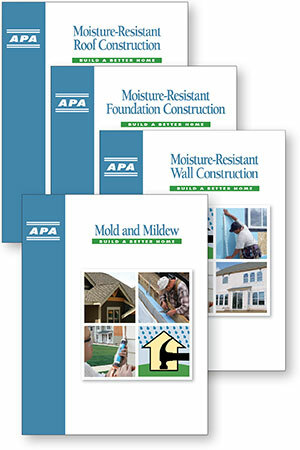 Designed to provide builders and homeowners the construction guidelines they need to protect their homes against damaging moisture infiltration, the Build a Better Home program from APA encourages better building practices for the key elements of a residential structure: roofs, walls, and the foundation. Throughout the world, properly constructed wood homes have lasted for centuries. Wood has been the building material of choice for residential and light commercial builders because of its strength and durability. However, an increasing number of homes are encountering moisture-related problems. Growing public concern, and a shortage of well-trained construction trade professionals point to the need for an extensive education outreach program to educate builders, design professionals and homeowners on how to properly install and detail engineered wood materials used in residential construction to protect homes against damaging moisture infiltration. This video segment is excerpted from the Build A Better Home: Moisture Control in Residential Construction video produced by APA. Always refer to current APA literature and consult your local jurisdiction or design professional to assure proper compliance with code, construction and performance requirements. Click thumbnail below to view video.